And fresh on the heels of Michael Coleman we move over to Scotland for some more traditional, magical, ancient music. 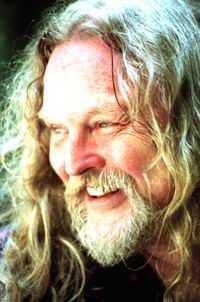 As a founding member of the Incredible String Band, Robin Willaimson’s place in music history would be secure if he had done nothing else. But he successfully reinvented his approach to music on multiple occasions, becoming in the process the greatest living example of a bard. He dug deep into the traditions of his music and found the travelling musician/storyteller/mythmaker/historykeeper archetype at its roots. He plays a number of instruments, from fiddle and guitar to harp and some of the weirder ones too… and he’s a fantastic raconteur. 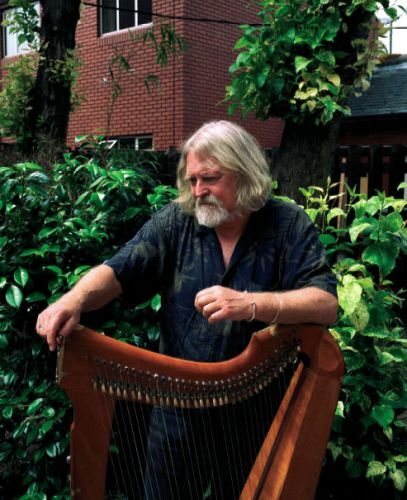 With this album he goes back to the most ancient of Celtic instruments, the harp. There is something very special about harp music: its purity of tone, its graceful simplicity of timbre and hue, its clouds of resonance. In the hands of many a lesser musician, this grace and purity gets lots in the clouds of vagueness and the music loses its dynamic form, becoming an over-relaxing blob of prettiness. Not so with Robin Williamson, never one to shirk a crooked tune. While it certainly never recalls his early work as a pioneer of ‘wyrd folk’ with the Incredible String Band, those who listen closely to this work will find not only a somber elegance but a lively spark of trickery as well. The magic of these tunes was certainly not lost on Williamson, who gives them an honest, faithful, and beguiling treatment. 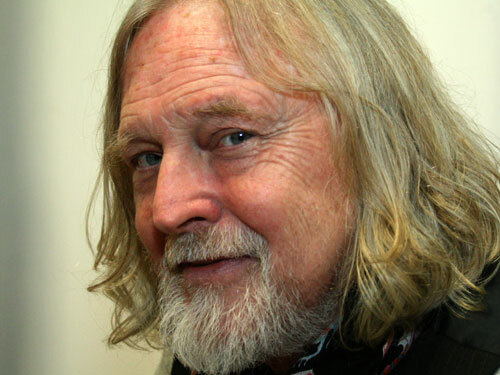 Between 1966 and 1974, Robin Williamson was one half of the Incredible String Band, but his career did not founder after ISB’s demise, although it might be said to have taken a few quirky turns, including a collaboration on a spy novel and the publication of a bizarre semi-autobiography. Away from these literary avocations, Williamson formed the Far Cry Ceilidh Band with Stan Schnier and Mark Simos, but never made it to the recording studio. In 1976, Williamson met with harpist Sylvia Woods, and together with Chris Caswell and Jerry McMillian, they formed Robin Williamson & His Merry Band. Between 1977 and 1979, they released three albums: the highly traditional Journey’s Edge in 1977, American Stonehenge in 1978, and A Glint at the Kindling in 1979, which featured the epic historical cycle “Five Denials on Merlin’s Grave.” After the breakup of the Merry Band, Williamson started to tour solo, offering highly ambient sets dominated by traditional stories set to song. Releases of this period include Songs of Love and Parting and the dedicated folklorist’s Legacy of the Scotish Harpers. Williamson’s concern with the British bardic tradition also manifested itself in several books and tapes containing spoken renditions of traditional tales. Subsequent projects saw the prolific Williamson recording tapes and discs of music for children and pouring his energies into environmental projects for the Scottish Wildlife Trust. Iron Stone was released on the ECM label in 2006.
cam ye lassies an weep. This entry was posted in celtic, flying fish, fruits, harp. Bookmark the permalink. seems tracks 3+7 are CRC-corrupted (media-file fault? ).